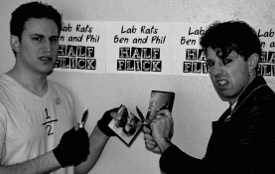 Lab Rats Ben and Phil have never seen one of Martin Scorsese's most acclaimed films, Raging Bull. Can they guess how Jake LaMotta's life ends up by watching just the first half? Lab Rats Ben and Phil predict how the ridiculously '80s comedy Teen Wolf ends... and couldn't be more wrong. Read their guesses at how Michael J. Fox keeps his wolfiness on the downlow. Lab Rats Ben and Phil watch the first half of 1946's The Postman Always Rings Twice and predict how this adulterous murder plot will go down. Is this an open-and-shut case? Lab Rats Ben and Phil watch the first half of John Carpenter's The Thing and predict how it ends. Can they sniff out who the monster is? Lab Rats Ben and Phil watch the first half of recent Oscar-winner Whiplash. Despite their vastly different predictions and even interpretations of the film, which of them comes out with a better solo riff on the movie? Lab Rats Phil and Ben watched the first half of Mad Max. With a film this random and meandering, how accurately can these two predict the vigilantics of the second half?